.. great viewing when you could get a spot to watch. Was afraid to move sometimes as I may not be able to see again. Not enough signs directing us where to go I think we walked the entire circuit by the time we found our entrance we needed! Had a great time after the stress of getting to the entrance! Prepare to walk!!! OK, first. There are screens big enough to actually see from your grandstands, and the commentating is not only enthusiastic and loud enough to hear but also bilingual (English). These two things got the crowd involved from practice, qualifying, to the final race – creating the famous Mugello atmosphere. I’m currently at the Catalunya GP and unfortunately the whole event is being let down by not having these things (tiny screens, inaudible commentating). The only way we knew qualifying was over was when the riders started waving to the crowd and em then I had to text hometo Australia to see who qualified where. And I’m in a grandstand directly in front of a screen (a tiny screen, like Phillip Islands). I’m sure race day will be a little more followable but I’ll have to fully learn the riders bikes and numbers in Moto 2 and Moto 3. Travel to and from the event was really really easy. On th Saturday I got on the first train there and then a makeshift taxi charged 5€ to take me to the door of the event. Same deal coming out of the event. Sunday I booked a shuttle with BookMoto just to be safe, but I’m not sure it was necessary as most people don’t arrive until midway through the day. The atmosphere, food, culture, is everything you’ve heard and more! I took more photos of these things then if the bikes. My only recommendation, take your own toilet paper ?. I should think a 220€ grandstand would provide this in the facility but unfortunately not. Certainly nothing to stop you from missing this remarkable experience. My boyfriend and me have just come back from one of the craziest weekends ever! Mugello circuit is awesome! We drove in our beloved camper from Calais to Mugello 18 hours drive with stops and arrived first thing Friday morning. We found the camper entrance easy enough. Checked in (they will search your camper for glass bottles) and went on in up to the campsite. I’m sure every Italian male had descended the campsite that weekend. Full of big groups of Italians determined to party the weekend away! Loud music all night, chainsaws revving some with homemade funnels on the end to make them sound like proper big racing bikes and also sirens. They also seem to bring everything with them. Plunge pools, consoles with tv screens, great big paella pans, huge generators, gazebos. One group had even setup their own bar! It was quite extraordinary to see the kit they bring! (We had two folding chairs, bbq and a table!) Do not camp here if you want to sleep! For us it was the only place to be and we would definitely camp here again. Being amongst all the chaos is just what we wanted but it isn’t for everyone. The circuit itself was good. Plenty of places to grab food and drink though it is very expensive. We sat in the poggio secco section. High up in row 20 and seats 61 & 62. Perfect place to sit. Two good turns and a screen right in front of us. Good view too of the rest of the circuit. As you can imagine full of 46 Rossi fans (I felt a bit of a traitor wearing my number 04 Dovi top!) and the atmosphere is awesome! Each of the stands have their own toilet blocks which are fairly clean. The downside and only downside to this weekend were the lack of toilet and shower facilities for the campers. By Sunday they were pretty foul and some people had actually decided to empty their bowels in the sinks and showers... Gross!! All in all an amazing weekend which we would most definitely go back to and yes, we would camp there again! Next stop for us Valencia at the end of the year!! Excellent atmosphere but alot of walking involved. Materassi grandstand divided into two sections positioned at approx 45deg to each other. Only one video screen for both stands so impossible for everyone to see the screen. We have been to Mugello Motogp several times but previously in the Poggio Secco stand and the view of the track similar but the placement of the video screen was better in the Poggio Secco stand. 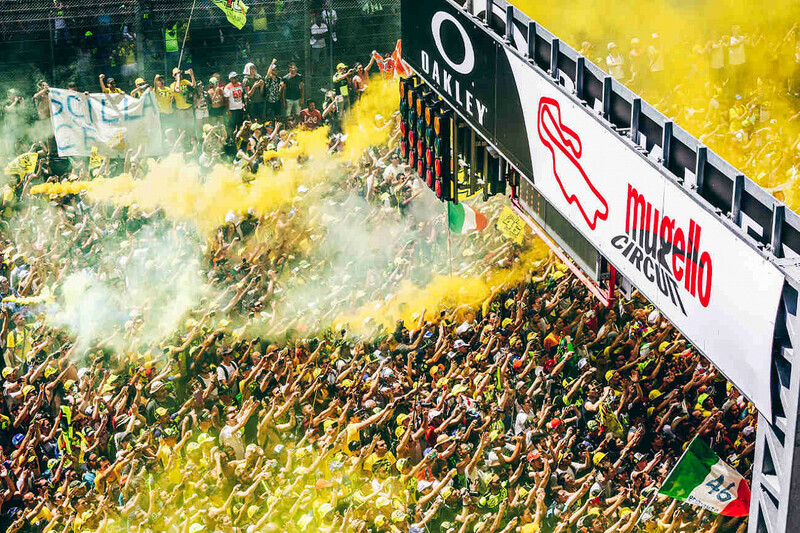 Like all major motor racing events, the atmosphere is why you attend. Mugello is the most beautiful venue...the facilities 5 star and Italy is amazing...well done to the organizers. A definite bucket list item for anyone!!! Would have been five stars but when we got there we realised that the rules had changed. Motorcycles are no longer permitted in the circuit so you have to park (15 euros a day) outside the track and carry your camping gear in with you. No fun in 30 degree heat! Camping Verde 6kms away is a better idea and either walk or ride up on an empty bike to get in. We had an awesome day at the race. It started out with well-organized transportation by Servito. We then arrived at the circuit and despite the large crowds, the lines and people were managed very well. We had seats in the central grandstand gold area which provided an outstanding view of the race. The food and drink served there were outstanding as well. Return transportation by Servito was also well-organized and I would definitely recommend using them to get to and from the track. It was a great race and a great experience! My boyfriend and me have just come back from one of the craziest weekends ever! Mugello circuit is awesome! We drove in our beloved camper from Calais to Mugello 18 hours drive with stops and arrived first thing Friday morning. We found the camper entrance easy enough. Checked in (they will search your camper for glass bottles) and went on in up to the campsite. I’m sure every Italian male had descended the campsite that weekend. Full of big groups of Italians determined to party the weekend away! Loud music all night, chainsaws revving some with homemade funnels on the end to make them sound like proper big racing bikes and also sirens. They also seem to bring everything with them. Plunge pools, consoles with tv screens, great big paella pans, huge generators, gazebos. One group had even setup their own bar! It was quite extraordinary to see the kit they bring! (We had two folding chairs, bbq and a table!) Do not camp here if you want to sleep! For us it was the only place to be and we would definitely camp here again. Being amongst all the chaos is just what we wanted but it isn’t for everyone. The circuit itself was good. Plenty of places to grab food and drink though it is very expensive. We sat in the poccio secco section. High up in row 20 and seats 61 & 62. Perfect place to sit. Two good corners and a screen right in front of us. Good view too of the rest of the circuit. As you can imagine full of 46 Rossi fans (I felt a bit of a traitor wearing my number 04 Dovi top!) and the atmosphere is awesome! Each of the stands have their own toilet blocks which are fairly clean. The downside and only downside to this weekend were the lack of toilet and shower facilities for the campers. By Sunday they were pretty foul and some people had actually decided to empty their bowels in the sinks and showers... Gross!! All in all an amazing weekend which we would most definitely go back to and yes, we would camp there again! Next stop for us Valencia at the end of the year!! Very professional agency. We had a small prob with payment, solved with bookmoto quickly and without troubles. A bowl of MotoGP craziness. Awesome crowds sights and circuit. First of all using Bookmoto worked perfectly. Tickets arrived 20 days before the race. I got front row seat on Poggio Secco grandstand. Every communication was clear and I had no worries. As far as Mugello is concerned, it was everything I expected. Unorganized, chaotic, crazy and I loved it. My plan was to stay in Florence and go to the race with train. First train on Sunday is at 7:29 and when they announce the platform number from which it is going it is a stampedo to get in. My advice is if you manage to get in the train among the first people don't rush to get seats. Stay in the corridor. There are some foldaway seats there and that way you will be among the first to get off the train and than be able to get in the buses waiting at Borgo San Lorenzo train station to get you to the race track (for free). There were two small buses there and one more coming. I don't think everyone managed to get in. The buses only got us half way there as roads near the race track were closed so we had to walk some 2 kilometers. And then all the people wanting to get to the east side of the track had to get in on one entrance (not clearly marked) with two little gates and all the security checks. And there were no lines, just a bunch of people pushing to get in. One hour later (around 10 AM) I was in. After the race of course track invasion. Again pushing through a few small gates to sprint to the podium. And then I had to exit the track (again pushing trough one small gate) on the other side and go all the way around. One hour of walking to get half way to Borgo San Lorenzo and then pushing in a bus to get to the train station and finally back to Florence. Really exhausting adventure, but no regrets. It was worth it. I am already making plans to go to Brno. Don't think there's much difference between the stands. We checked them all out on the Friday. Had a seat in the materassi stand. No huge queues for toilets Took our Motorhome and stayed on site. Fabulous but get there on Thursday or Friday am if you intend to do this. Moving the camper once sited is impossible so you'll need to have enough water or a way of getting water to your Motorhome. DJs in a couple of locations till 4am. Had an amazing time at Mugello and overall a great day out. The Rossi fans were tremendous and whole atmosphere was brilliant and everyone really friendly/helpful. Definitely would do again. A lot of walking!! ALOT!!! of walking!.. Far too many tickets sold for the gold area struggled to see and when we did get a spot we where afraid to move!.. Views where amazing.. had a great time! Great Experience. Many improvement opportunities. BookMoto were great however as first time attendees (from Australia) at Mugello there are many things to be aware of. 1 - If you are camping, you need to purchase camping tickets AND General Admission tickets on top of your VIP tickets. 2 - If you camp in the wrong area eg. Pallagio you cannot get to the VIP area without then purchasing Grand Stand tickets or walking around 3/4 of the track (even if they will let you)! 3 - Hospitality 5/6 out of 10 and no big screen to watch the action when on the balcony. TVs were on silent inside the lounge. We asked to be moved to MotoGP Lounge 1 which is normally reserved for private corporates but they had a big screen for viewing from the balcony, which was great. 4 - Speak to Dorna personnel upon arrival and obtain a "Vendor Pass" as without it, you may experience trouble obtaining access and egress. 5 - If camping, be prepared to not sleep for 3 days unless you have ear plugs. The Italians are crazy!!!! 6 - Dont try to get out of the camp grounds on Sunday night until after 8 or 9pm as they hold campers back until all cars and bikes are gone. 7 - The camp ground toilets are something to behold!!! Be prepared and if you don't have to use them, it's probably for the best ?. Off to our second BookMoto.com experience in Catalunya next week, so hoping for something very different ? ?